I always find that I start the New Year with a fresh outlook, but I find that it gets harder to keep those resolutions and promises going as the months roll forward. I think because the holiday season is so full of decadence when it comes to food that everyone feels like a fresh and healthy diet is something to strive for as a new year begins. I am one of those girls who doesn’t set resolutions, but instead I set goals for my year ahead. Goals that I can tangibly check off and keep myself accountable for. One of them has been to spend more time making healthy dinner’s at home, and I have to say it’s been going amazing! Another is to make healthier choices when it comes to what I consume every day, and what my son consumes every day. 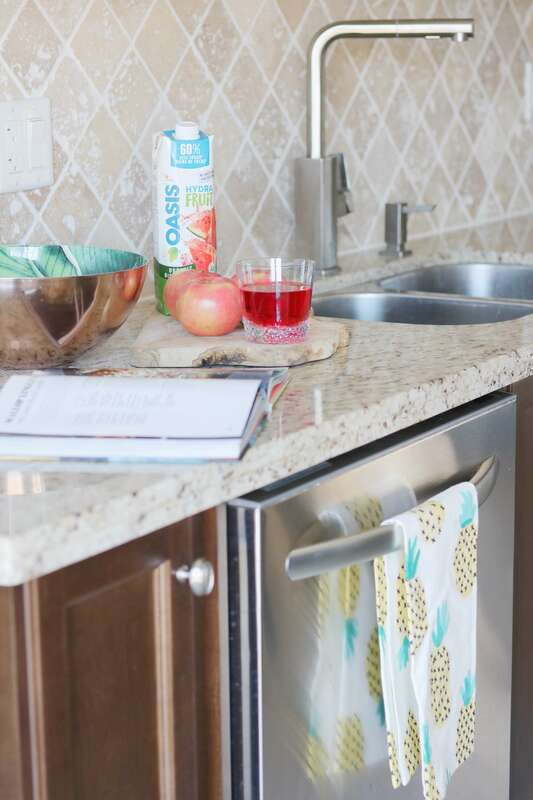 This January I started stocking our fridge with Oasis Hydra Fruit Organic fruit juices and filtered water blends, so instead of reaching for something full of sugar or caffeine we are all reaching for a fresh alternative! My mornings start with getting my son ready for school every day. Integrating a healthy and delicious beverage choice is a great way to help achieve the balanced diet goals I have for this year. 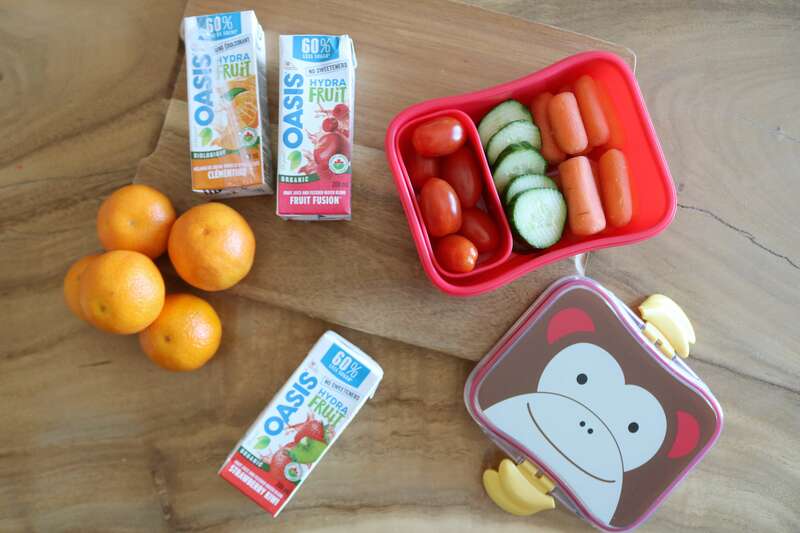 With his lunches I’ve been packing Oasis Hydra Fruit boxes (his favorite is watermelon apple, but so far he loves all of them! ), and I feel good about sending them to school because they have no added sugar, stevia, or artificial sweeteners. They are made up of 50% organic fruit juice and 50% filtered water, plus they have 100% of your recommended vitamin c intake per 250ml serving. I love that it gives my child the chance to drink more water while maintaining the taste of juice he likes! I’m trying to do better with my own breaks. I’ve been trying spending less time on screens, and more time with good books. 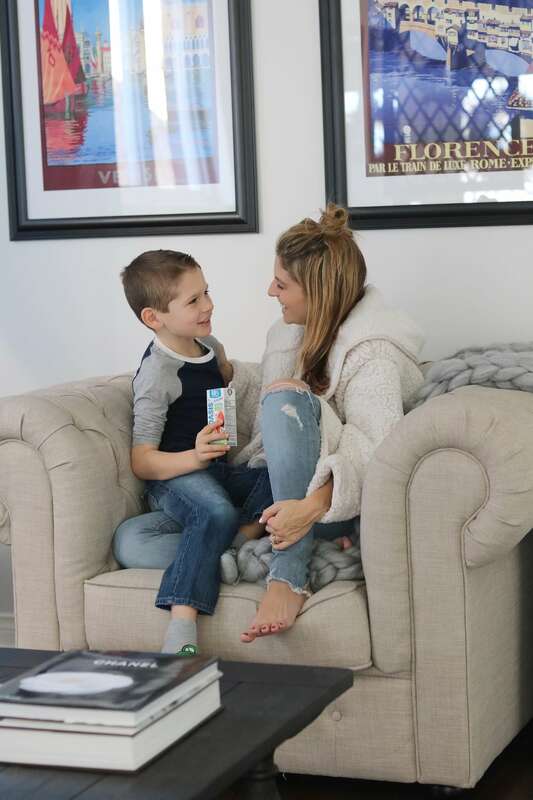 I’ve been incorporating these breaks with my son as well, and we’ve both been hanging out reading, and healthy snacking. 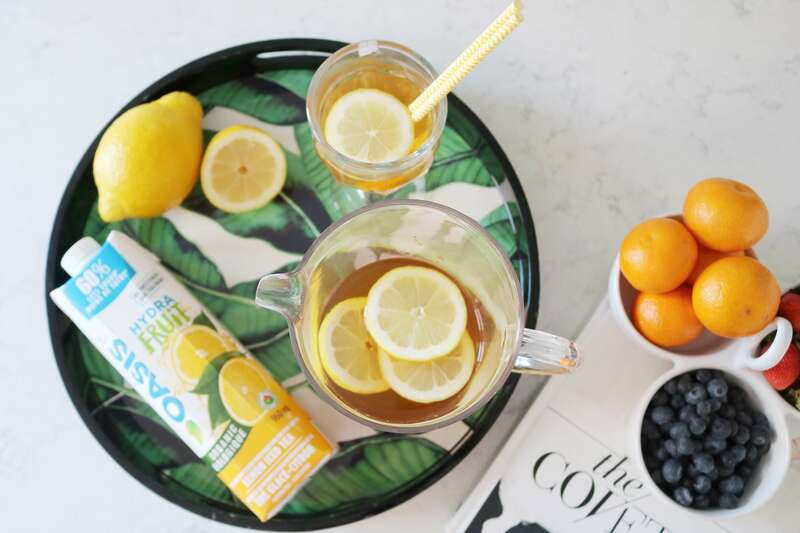 The Oasis Hydra Fruit Organic Lemon Iced Tea is perfect as it is, but I love to add some slices of lemon so it feels even more like an afternoon siesta! 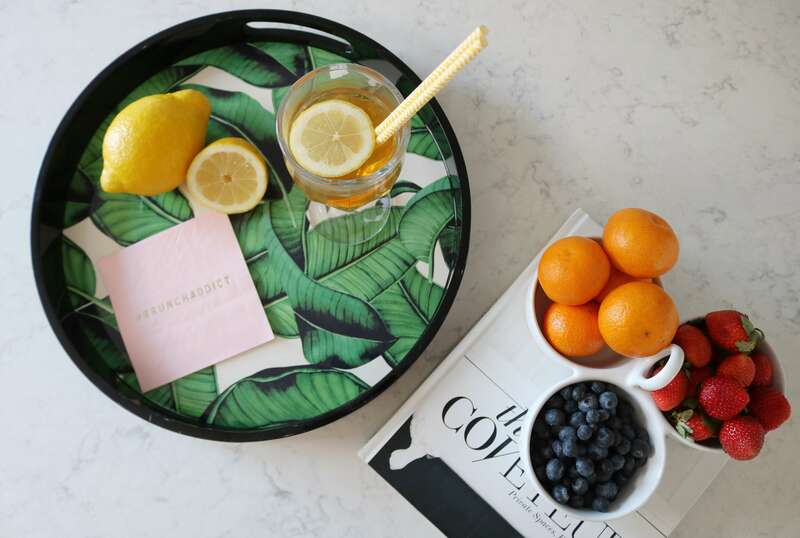 How can you not feel relaxed sipping Lemon Iced Tea with slices of lemon and cute paper straws? 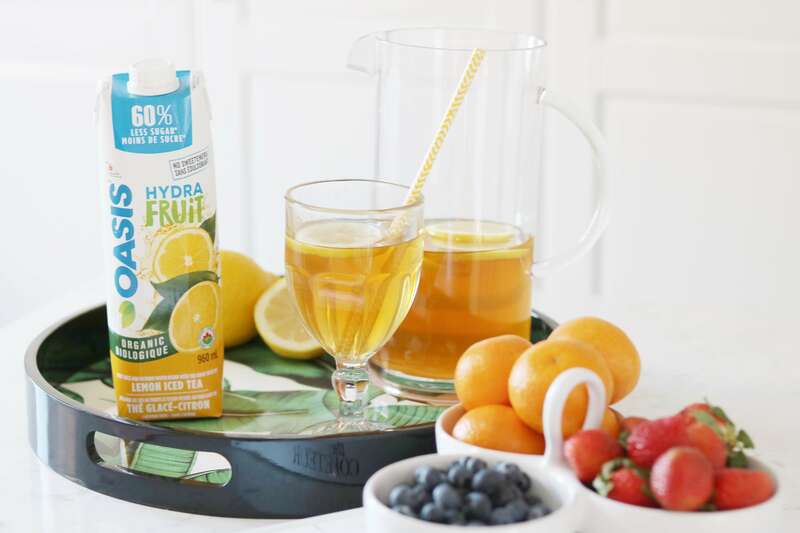 Hydra Fruit contains 60% less sugar and calories than the leading regular fruit juice blends and they are certified organic, so these little breaks are a bit more on the healthy side as well. 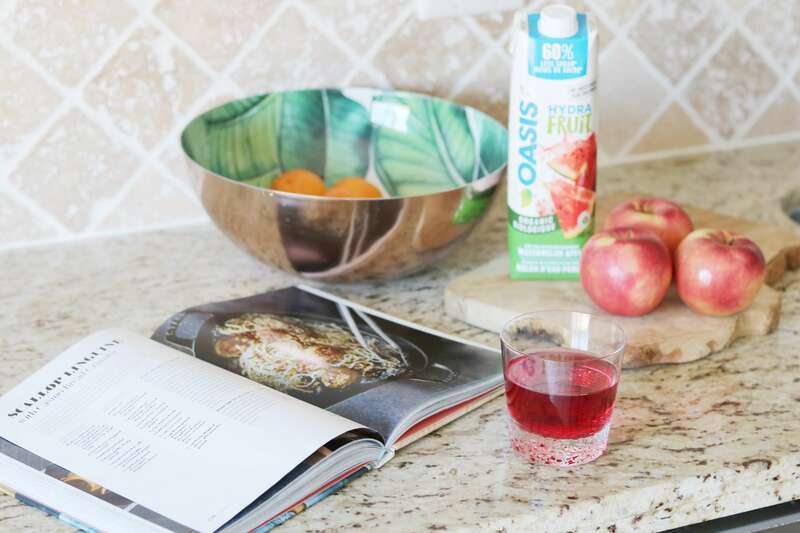 Oasis Hydra Fruit Organic beverages are sold in 960ml containers so you can keep them ready to go for a glass in the morning, and also 200ml grab-and-go containers for those lunches that need to head to school every day! So far we’ve tried them all – Fruit Fusion, Watermelon Apple, Lemon Iced Tea, Strawberry Kiwi and Clementine. Oasis Hydra Fruit Organic products are also packaged and processed entirely in Canada, so you are supporting local if you are a Canadian gal like myself! To see the whole range of Oasis Hydra Fruit Organic beverages, visit their website here! They have all kinds of nutritional information, recipes and more to check out! I want YOU to start your New Year off right as well, so I’m giving away an amazing prize package valued almost $300! To enter, head over to my Instagram page here! I’m excited to choose one lucky winner to receive everything in prize package! Have a great week everyone, and good luck to those who enter the contest! Items in this post may have been provided to me for review, but all opinions are fabulously my own. This post was sponsored by Oasis Juice Canada. Previous Post Valentine’s Day Style from Gap’s Love Connection Shop! Valentine’s Day Style from Gap’s Love Connection Shop!